Reading the tea leaves and the coffee cup is known as the Tasseography, although this practice rooted in the ancient Chinese art of reading the tea leaves, it also practiced by the clergies. Later this art moved to the Middle East, where the milled coffee took the place of tea leaves, but the Greeks and Turks those who have presented the coffee cup reading to India. How to read the cup? It is by turning the cup on the saucer then returning it to its normal position. The remains and images that shaped by the rest of the coffee interpreted by the reader of the cup and describe its meanings. Also some conditions must be fulfilled before reading the cup such as to drink the coffee from a cup, not from a glass because the lines in the cup become short and easy to read unlike the glass or the transparent glass cup and the reading should be in clockwise direction. The rest of the coffee may forms figures such as letters, numbers, geometrical designs , straight lines , wavy lines or shapes which resemble animals or birds. Where the non-dry upside down cup for a long period indicates a future grief for the person who drank it, according to claims, the trees indicate to life and success , the shape of heart indicates to love, and if the shape of ring appeared on the cup wall , this indicates to sooner marriage, and if a flag or a banner appeared , it will be good news of great triumph and achieved win, and death indicates long life for the person who drank the cup, and if a clock appeared , it indicates to much livelihood and welfare, while numbers indicate to money. Straight lines indicate to accurate design and peace of mind, while the shape of the cup indicates to love and harmony. The lines may refer to a journey or a road to be taken by humans as if the line was straight with no curves , it indicates that it is the right way, and vice versa if the line curved and exceeded its way, that means that there are coming problems to the person who drank it. And when there are points precede the line, it means that this person is about walking in this road, while if it just a point , it means that the road is close maybe after an hour or a day or a week or a month or a year. A camel indicates that the person who drank the cup is expecting a lot of goodness (money), because the camel is a symbol goodness convoys, and also the image of whale indicates to a lot of goodness and good fortune, and the image of pigeons indicates to good news because pigeons are messengers, while the repulsive graphics such as wood board indicates to the death to a relative of the person who drank the cup and other graphics that indicate to the grief and distress. The snake means a mortal enemy that lurks the person who drank the cup. She is 46 years old, of a Syrian descent, became famous for this art in India, as she reads the cups of eminent personalities such as "Sonia Ghandhi" who leads the Congress Party, and her daughter "Priyanka", and the former Indian prime minister "Atal Behari Vajpayee", and a lot of famous Indian businessmen and filmmakers. Ghandhi claims that she inherited reading the cup of coffee from her grandmother and her mother who were experienced in this art. Amazingly, despite her claim about her ability to read the cups of the others, she has no idea what her cup says. After her divorce in 1991 and for taking care of her children , she left India to the UAE to become a teacher and then a policewoman. Having lived outside India for 15 years, finally she took reading the cup as a career, knowing that her parents emigrated from Syria to India in 1936. Nawal Gandhi says that the coffee cup reading is difficult and depends on the senses and the sixth sense. 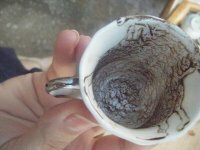 It is basically a psychological reading made by using a cup of coffee, which in most cases be « milled Arabic or Turkish or Greek coffee, which is very tasty». She is famous for "Om Mohammed" and lives in the high-class district "Al-Mohandseen" Giza, Egypt, she is famous for her ability to read the upside down cup and interpreting its lines and symbols, where she says :"My career is not new to the community but it may have taken a particular significance in these days because the increase of people's concerns and their fondness to know what lurking them and awaiting them, and perhaps their concern at the failure in solving their problems". She denied her knowledge of the unseen, and confirmed that her reading for the cup does not disappoint, but it is all , as she said ,"She reads the signs and the drawings of the cup by which she concludes what the coming days hide to the person who drank the cup". The mental health expert Dr. Hamdi Yassin says that the spread of the fortune-teller profession, especially the cup female reader and the palmist and shells reading were known by humans from ancient time and it has a historical meaning, and it is believed that humans tend to know a part of the unknown by nature, especially in matters that the laboratories and the scientific theories failed in finding an interpretation of it, which known as the conduct of uncertainty, which is a part of human life and is not limited to a particular class of people, where there are scientists up to the great scientific degrees but they be haunted with those ideas from time to time because it is an ancient inheritance and still fixed in our human behaviors, clearly appears in the illiterates and nomads, while it appears less in academics. Dr. "Hamdi Yassin" explains that who practice the fables just like the cup reader, the palmist and shells readers and so on , have a special abilities in inspiration and manipulating with the people feelings beside the psychological preparedness for some people to hear those fables and believe in it because we recognize that there is a metaphysical thought and our tangible life which we live is not the entire life, where there is a Metaphysical world lives with us which is known in the psychological science with the metaphysics science, and which refers to everything that conflicts with the concepts of the human mind. The cup female reader inspired the famous Syrian poet Nizar Qabani (1923-1998) to write a poem that holds same name "The Cup Reader" which later sang by famous Egyptian singer Abdel Halim Hafez (1929-1977). Lyrics tells about a man loved a woman but he lost her so he seek help of a woman who can read his coffee cup in his attempt to know where is she , but unfortunately signs tells that there is no future of this love and she will be lost forever! And your life books and wars. And you will die so many times, so many times. And you will return back as a defeated king. Siete stati che perseguono soltanto una traccia di fumo. Non ha terra, né casa, e senza indirizzo. My mother can read the coffee marks.she said one night when she was pregnant she saw a woman in her dream and this woman gave her a cup and she can read the coffee marks since then. can someone help me find a coffee reader in bahrain . kindly email : [email protected] or post here. I have been getting done my prediction by Sonnika from mumbai. she is good in coffee cup reading . My name is Courtney Bieneman and am talking as the happiest person in the whole wide world today and i told my self that any lender that rescue my family from our poor situation, i will tell the name to the whole wild world and i am so happy to say that my family is back for good because i was in need of $186,000.00 USD loan to start my life all over as i am a single mum with 2 kids and the whole world seemed like it was hanging on me until i met this GOD sent loan lender that changed my life and that of my family, a GOD fearing lender, Mr Mason Diego, he was the Savior GOD sent to rescue my family and at first i thought it was not going to be possible until i received my loan of $186,000.00 USD from him; so am advising anyone of you genuinely in need of loan to contact Mr. Mason Diego via email: ( [email protected] ) or reach him through the company website: http://diegoloancompany.wix.com/loans for a quick and secure loan.